Chunky Thick Italian Beef Stew, full of big pieces of Beef and lots of fresh vegetables. All simmered together in a Delicious Italian Sauce. Here we are already in February, I know we always say it but it is absolutely incredible how time flies. Soon we will be ditching our heavy coats and hats and grabbing our flip-flops. But hold on, not so fast. In fact here in Italy it is rainy and cold (well cold for us at least). Which means Comfort Food is still being served. 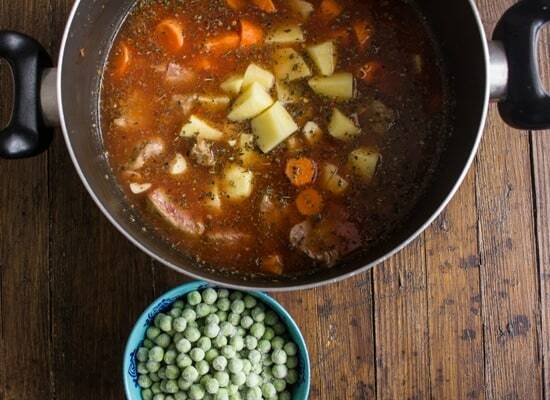 And believe me you are going to love this Chunky Thick Italian Beef Stew. 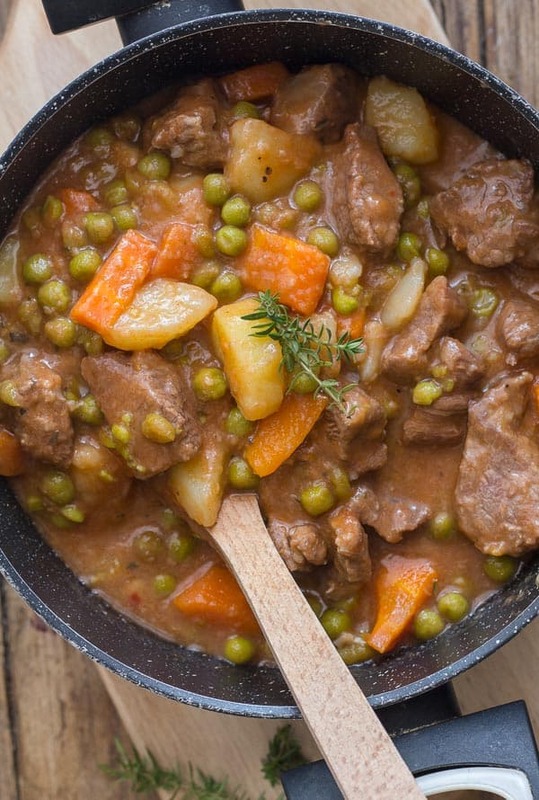 I first tasted a Beef Stew like this when the Italian and I went to visit relatives in the North. 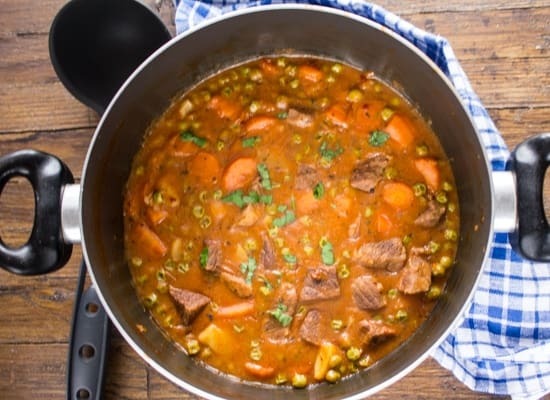 My husband’s aunt made the best thick beef stew with peas I have ever tasted in my life. More Beef Recipes you may enjoy! I can remember eating boiled peas as a kid and I am telling you now Italians know what they are doing when they cook. Peas never tasted so good! 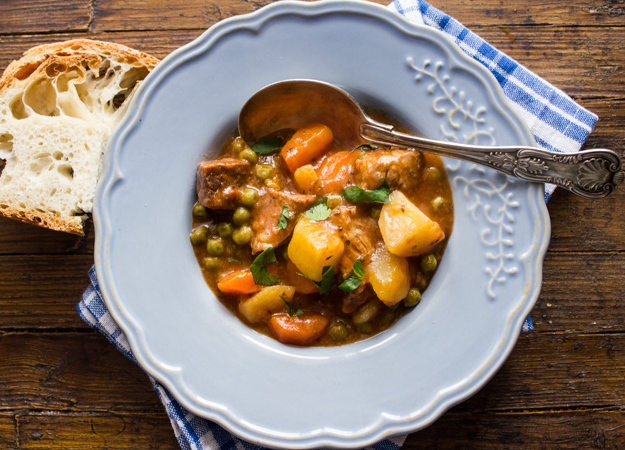 I love One-Pot-Dinners and this Simple Stew is one of them. Everything dumped in one pot, slow cooked to mingle all those amazing spices and veggies. 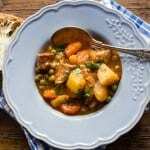 What is the best cut beef for stews? Chuck Beef, Chuck Shoulder, Chuck Roast or Beef Round Cuts. I prefer to buy a large piece, and cut it myself into bite size pieces (remove some of the fat if necessary. These are the cheaper cuts of beef and are perfect for slow cooking especially when making a soup or stew. 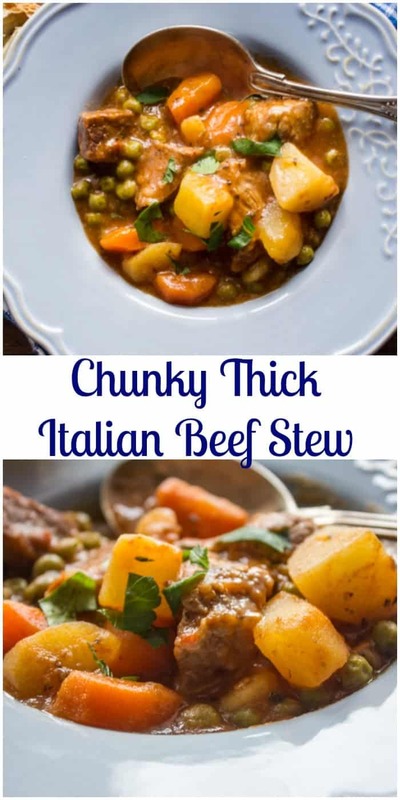 I love it thick especially when you serve Thick Italian Beef Stew with some crusty Italian bread. 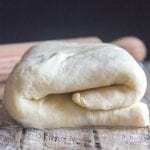 Or why not make some homemade Easy Focaccia Bread, perfect with this stew! Dredge the cut up beef in flour. In a large pot on medium heat add olive oil and the beef and brown. Then add the remaining ingredients, garlic, tomato puree, salt, basil, oregano, bay leaf, carrots, peas and potatoes, bring to a boil then lower the heat and simmer half covered for approximately 30 minutes until veggies are tender. Remove lid, raise heat and cook you reach the desired thickness. Serve immediately. If you like it more soupy then just cut down on the cooking time at the end. Buon Appetito! The Perfect cold evening comfort food. Dredge beef chunks well in flour. In a large pot add 2 tablespoons olive oil, floured beef chunks and brown. Add garlic, tomato puree, salt, basil, oregano, bay leaf,hot pepper flakes, water,bouillon cube, carrots, peas and potatoes cover and bring to a boil on medium-high heat, lower heat, 1/4 uncover and simmer for approximately 30 minutes (until veggies are tender) uncover and raise heat cook until desired thickness. 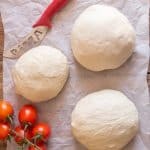 Serve immediately with Italian crusty bread. Enjoy! Hi on the stove now. Quick question when you say to brown the meat should it be browned to doneness or will it cook through while simmering? Hi Paola, just brown it on all sides a couple of minutes it will cook through while simmering. Let me know how it goes. I am so glad I found this sight. 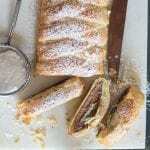 As an italian I love the recipes. nice work. thanks. So glad you found the blog too Theresa. Have a great week. Jan.7/17 Just made this stew this afternoon. It is a definite keeper! It’s easy and oh so delicious. a perfect supper on a cold and snowy day! Hi Cathy, so glad you enjoyed it. Have a great week. Thanks Katherine, you are so kind. Hi Nina, thanks hope you enjoy it. 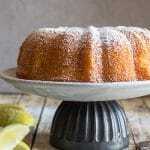 I love being part of the Thursday Favorite Things Blog Hop, have a great weekend. 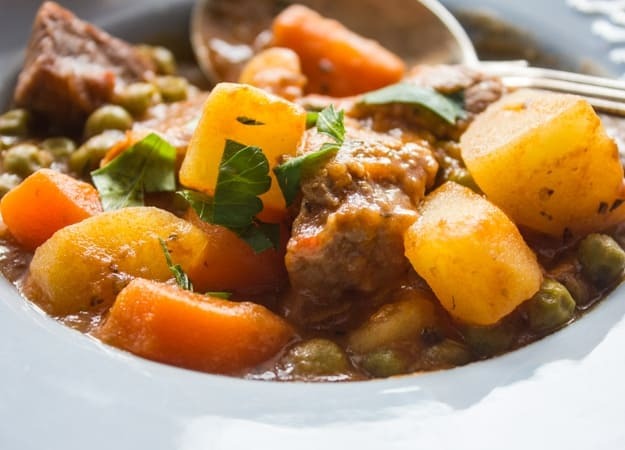 This stew looks absolutely delicious! 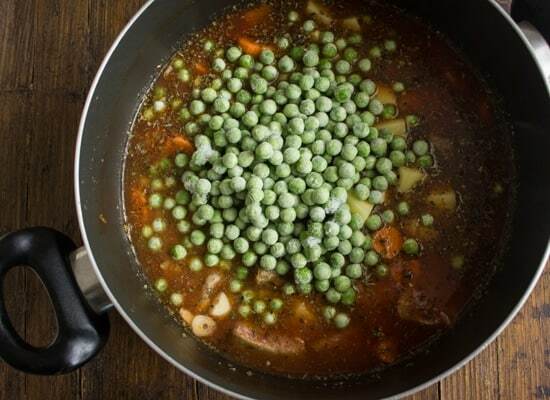 I’ve never had peas in my beef stew, but I love peas, so why not?! Thanks for sharing! Hi Alex, thanks peas are really tasty in this stew. This is the perfect crock-pot meal. Can’t wait to try it. Hi Rosemary! I think this stew is just what I’ve been craving. I am wanting some hot filling comfort food. I do enjoy one pot meals — to me they just shout home cooking. BTW, I was serious about sending you some Spaghetti squash seeds if you’d like! Hi Marisa, thanks hope you enjoy it, thanks so much for the offer, but I think my sister is coming in a couple of months 🙂 and with the way the mail is here I would probably get them next year. haha.